Mary Cotter, Marketing/Education Director of the Richmond-based HRS, says that the timing of this educational effort couldn’t be better. “Promoting adoption and educating potential adopters early in the year helps to prevent the impulse purchase of bunnies a month or two later at Easter time. This, in turn, will reduce the number of rabbits relinquished to shelters.” This month, HRS volunteers will be putting in many extra hours to teach potential adopters what to expect when living with a rabbit. HRS works to debunk the myth that rabbits are ideal pets for children; in reality, even baby bunnies tend to be willful and independent, do not enjoy being picked up and carried, and are easily injured when dropped. HRS also cautions against buying or adopting a rabbit as a gift, or on a whim, as the novelty usually wears off quickly. 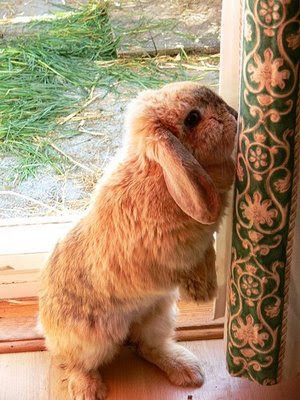 When a family realizes how much day-to-day work is involved, the rabbit is, unfortunately, surrendered to a shelter, or– worse — released outdoors, where he often becomes the victim of a predatory animal or a speeding car. The mission of HRS is twofold: to educate the public about these often-misunderstood companion animals, and to help rescue and “re-home” domestic rabbits. HRS advocates spaying and neutering rabbits – both for health reasons and also to help put an end to the animal overpopulation problem. This entry was posted in HRS, Rabbit, rescue on February 3, 2009 by yourfriends.